Reports say four men yesterday lost their lives in a multiple accident around Otedola Bridge on the Lagos-Ibadan expressway. The incident caused a gridlock on the highway which left motorists stranded for hours. 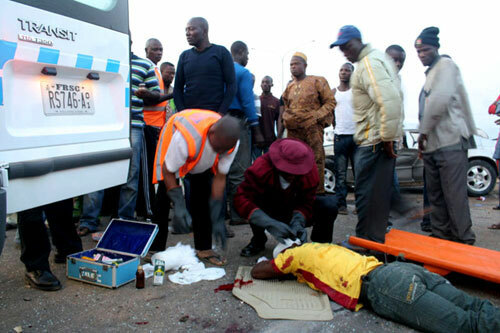 According to Bisi Kazeem, the deputy education officer of the Federal Road Safety Commission (FRSC), the accident included an articulated lorry, a fuel tanker, a truck and at least two saloon cars. He said, “We do not have access to other affected vehicles yet. Kazeem advised motorists to drive carefully and exercise patience as the FRSC men make efforts to ease the traffic gridlock. He reportedly said, “All relevant agencies are on ground trying to remove affected vehicles and restore normalcy. “The Lagos State Emergency Management Agency (LASEMA) is setting up floodlights while men of the fire service are blanketing the area,” Kazeem said.